StartsidaTraditional CultureFrederick The Great – The Majestic King Of Prussia… 2017-10-16..
Few if any European monarchs can compare with the mythical Prussian King Frederick The Great. 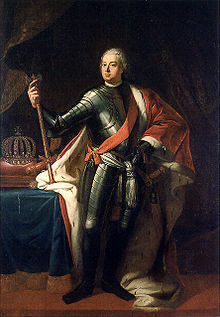 Frederick II (German: Friedrich; 24 January 1712 – 17 August 1786) was King of Prussia from 1740 until 1786, the longest reign of any Hohenzollern king. Frederick was the sole surviving son of his father, the famous Frederick I. Frederick William I, popularly dubbed as the Soldier-King, had created a large and powerful army led by his famous “Potsdam Giants”, carefully managed his treasury finances and developed a strong, centralized government. However, he also possessed a violent temper and ruled Brandenburg-Prussia with absolute authority. 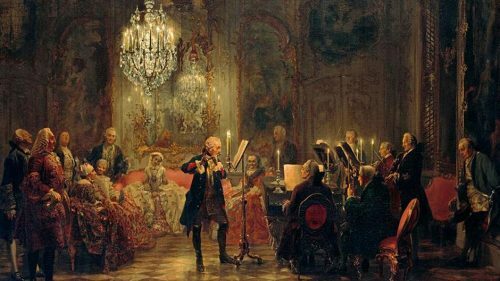 Frederick the Great had an affinity for poetry, music and literature, especially antique works. Frederick grew up under strict discipline and was trained to become a soldier from a very young age. He was woken up by a cannon shot at 4 am every day from a very young age and went through rigorous military training and discipline. His father emphasized that the Prussian King should be like simple folks without the posh manners of many other Kings in Europe. As Frederick grew, his preference for music, literature and French culture clashed with his father’s militarism, resulting in Frederick William frequently beating and humiliating his son. His father was afraid that his son would be effeminized by other interests than strictly military ones. Frederick was often beaten by his father and by the time he was 18 years old he tried to escape from Prussia and his father´s tyranny. Frederick plotted to flee to England with his close friend Katte and other junior army officers. Frederick and Katte were subsequently arrested and imprisoned. 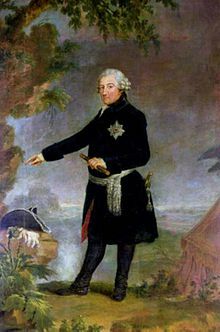 Because they were army officers who had tried to flee Prussia for Great Britain, king Frederick William leveled an accusation of treason against the pair. The king briefly threatened the crown prince with the death penalty, then considered forcing Frederick to renounce the succession in favour of his brother, Augustus William. The king then forced Frederick to watch the decapitation of his confidant Katte. Frederick was granted a royal pardon and released from his cell although he remained stripped of his military rank. Instead of returning to Berlin, however, he was forced to remain in Küstrin and began rigorous schooling in statecraft and administration for the War and Estates Departments. The crown prince returned to Berlin in 1732. Frederick was arranged to marry a 17 year old duchess in 1733 – which Frederick reluctantly agreed to. If we take a look at Prussia prior to the rule of Frederick and his father the state was small with an infertile land and no natural resources with an over-indebted public budget. Frederick´s father who economized to the extreme saw himself as a moral role model, while the son saw himself as an exemplar of reason for the religiously, ethnically, and linguistically diverse Prussian state. The extended Prussian territory was home to Protestant, Catholic and Jewish subjects, of Germans, Poles, Sorbs and Kashubians. 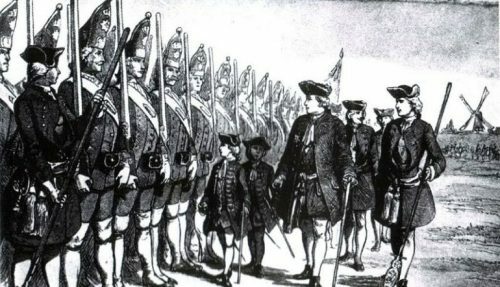 The Prussian virtues, while traced back to the Teutonic knights, were named by King Frederick William I of Prussia, the “soldier–king” and frugal “bourgeois” reformer of Prussian administration, as well as from his son, Frederick the Great. Prussia received a highly-advanced administration and legal system, as well as a loyal officer corps and a kind of common-sense patriotism gathering the subjects behind the Hohenzollern ruler. Frederick the Greaat always emphasized that the noble people should marry within their own class but he also emphasized ability more than class. Generally the officers were recruited from the noble class. Based on these virtues two generations of Frederick Kings transformed Prussia from a powerless small state into a military superpower with highly disciplined soldiers and citizens. Frederick wrote a book called “Anti-Machiavel” where he outlined how a good ruler should rule his country. 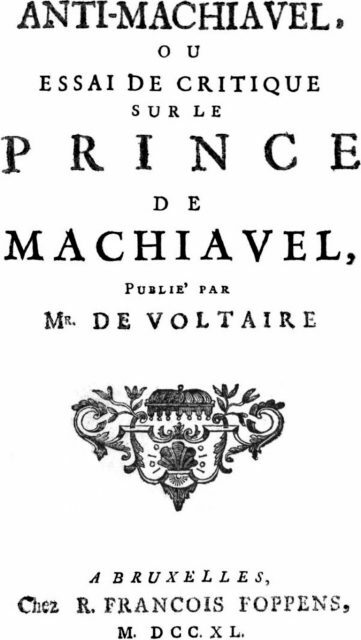 He was outraged by the contemporary ideals of the decadent Machiavellian culture among the royal courts in Europe at the time, especially in France. 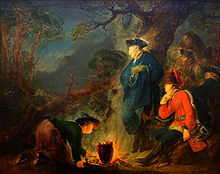 Frederick’s goal was to modernize and unite his vulnerably disconnected lands and he fought wars mainly against Austria, whose Habsburg dynasty reigned as Holy Roman Emperors almost continuously from the 15th century until 1806. Frederick established Prussia as the fifth and smallest European great power by using the resources his frugal father had cultivated. During the “War of the Austrian Succession” which spanned from 1740 to 1745 Frederick conquered Silesia from Austria and hence almost doubled his population and territory. Frederick quickly showed his great skills as a commander and he was perhaps the most aggressive commander of western history, inflicting great damage and chaos to his opponents. During the “Seven Years War” Frederick faced a formidable coalition formed by Austria, France, Russia, Saxony and Sweden. Few could imagine that he could ever get out of that stranglehold but Frederick was clever and allied himself with Great Britain and quickly attacked Saxony. After some initial successes Frederick surely but slowly had to retreat and suffered his first military battle defeats. But he always recovered after each defeat but after the British withdrew their financial support in 1762 his situation was desperate. With the sudden death of the Russian Empress the whole situation changed and the Russians withdrew their troops when their new Tsar, Peter III ascended the throne. 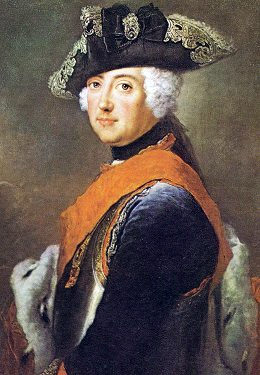 Peter III was so impressed and humbled by the legendary Frederick that he stated that he would rather have been a general in the Prussian army than being the Tsar of Russia. This further showed the mythical reputation of Frederick as the ultimate enlightened ruler and military genius. After the Russians joined forces with Prussia the war soon came to an end and Frederick retained all his territories. The prize for victory had been paid though because most of his friends and generals died during the war. Frederick later turned his sights on Poland, a country he considered barbarian and primitive. Prussia and Russia agreed to the First Partition of Poland in 1772, which took place without a war. Frederick claimed most of the Polish province of Royal Prussia. Prussia annexed 20,000 square miles (52,000 km2) and 600,000 inhabitants, the least of the partitioning powers. However, Prussia’s Polish territory was also the best-developed economically. The newly created province of West Prussia connected East Prussia and Farther Pomerania and granted Prussia control of the mouth of the Vistula River. Frederick tried to reform the Polish province by his civilized model state and he achieved some success and economic benefits too. Later wars about Bavaria and other German provinces were minor skirmished compared with the earlier big wars and they didn´t change the power of Prussia. Contrary to what his father had feared, Frederick proved himself very courageous in battle (with the exception of his first battlefield experience, Mollwitz). 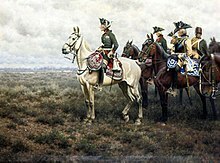 He frequently led his military forces personally and had six horses shot from under him during battle. During his reign he commanded the Prussian Army at sixteen major battles (most of which were victories for him) and various sieges, skirmishes and other actions. He is often admired as one of the greatest tactical geniuses of all time, especially for his usage of the oblique order of battle, in which attack is focused on one flank of the opposing line, allowing a local advantage even if his forces were outnumbered overall (which they often were). Even more important were his operational successes, especially preventing the unification of numerically superior opposing armies and being at the right place at the right time to keep enemy armies out of Prussian core territory. An example of the place that Frederick holds in history as a ruler is seen in Napoleon Bonaparte, who saw the Prussian king as the greatest tactical genius of all time; after Napoleon’s victory of the Fourth Coalition in 1807, he visited Frederick’s tomb in Potsdam and remarked to his officers, “Gentlemen, if this man were still alive I would not be here”. 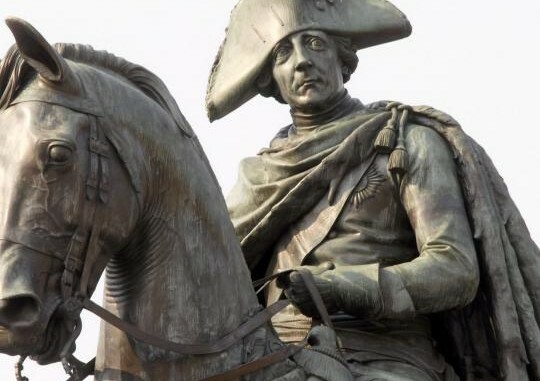 Napoleon frequently “pored through Frederick’s campaign narratives and had a statuette of him placed in his personal cabinet.” Frederick and Napoleon are perhaps the most admiringly quoted military leaders in Clausewitz‘ On War. More than Frederick’s use of the oblique order, Clausewitz praised particularly the quick and skillful movement of his troops. Frederick the Great’s most notable and decisive military victories on the battlefield were the Battles of Hohenfriedberg, fought during the War of Austrian Succession in June 1745; the Battle of Rossbach, where Frederick defeated a combined Franco-Austrian army of 41,000 with a mere 21,000 soldiers (10,000 dead for the Franco-Austrian side with only 550 casualties for Prussia); and the Battle of Leuthen, which was a follow up victory to Rossbach pitting Frederick’s 36,000 troops against Charles of Lorraine’s Austrian force of 80,000—Frederick’s masterful strategy and tactics at Leuthen inflicted 7,000 casualties upon the Austrians and yielded 20,000 prisoners. Frederick the Great believed that creating alliances was necessary, as Prussia did not have the comparable resources of nations like France or Austria. After the Seven Years’ War, the Prussian military acquired a formidable reputation across Europe. Esteemed for their efficiency and success in battle, the Prussian army of Frederick became a model emulated by other European powers, most notably by Russia and France; the latter of which quickly applied the lessons of Frederick’s military tactics under the direction of Napoleon Bonaparte upon their erstwhile European neighbors. In war…he usually saw one path to victory, and that was fixing the enemy army in place, maneuvering near or even around it to give himself a favorable position for the attack, and then smashing it with an overwhelming blow from an unexpected direction. He was the most aggressive field commander of the century, perhaps of all time, and one who constantly pushed the limits of the possible. 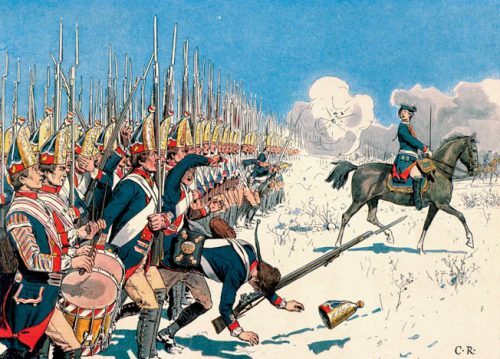 Frederick asked his hesitant guards at the battle of Kolin, 18 June 1757. “If I had a province to punish, I would let it be governed by philosophers.” Frederick stated another time. “Die peacefully.” , Frederick reportedly told a wounded soldier who was crying out loud. Foresight ranked among the most important attributes when fighting an enemy, according to the Prussian monarch, as the discriminating commander must see everything before it takes place, so “nothing will be new to him.” Thus it was flexibility that was often paramount to military success. Donning both the skin of a fox or a lion in battle, as Frederick once remarked, reveals the intellectual dexterity he applied to the art of warfare. Despite his dazzling success as a military commander, Frederick was no fan of protracted warfare, and once wrote, “Our wars should be short and quickly fought… A long war destroys … our [army’s] discipline; depopulates the country, and exhausts our resources.” Martial adeptness and that thoroughness and discipline so often witnessed on the battlefield was not correspondingly reflected on the domestic front for Frederick. 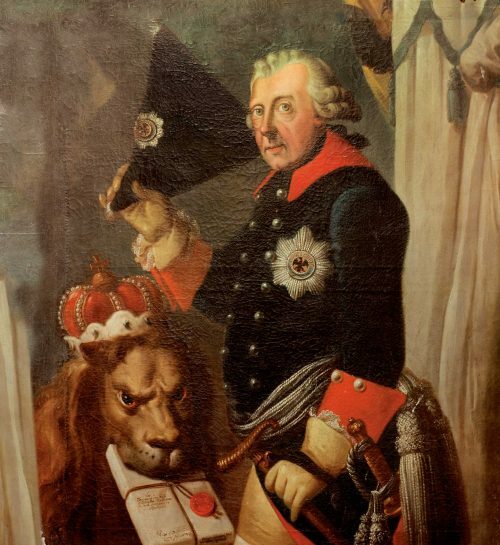 In lieu of his military predilections, Frederick administered his Kingdom justly and ranks among the most “enlightened” monarchs of his era; this, notwithstanding the fact that in many ways, “Frederick the Great represented the embodiment of the art of war”. Consequently, Frederick continues to be held in high regard as a military theorist the world over. Frederick could risk everything including his human life, his kingdom and his reputation in any military battle. It is said that Frederick told his Generals unceasingly that courage is the first quality of a soldier and that they must make great plans and achieve great victories in order to be remembered in the world history. Even if they could only have success 2 out of 10 times it would be enough for them to create their immortality. He treated a mere lieutenant visiting his palace higher than the court officials and called the noble men who were not militaries “pitiful”. The Prussian noble people were rigorous, disciplined people with pride in their military profession and they kept all their privileges in terms of clothes and honor. This made them more motivated and dedicated to their work. He forbade young officers to marry at a young age and told them that they needed to create honor with the sword rather than with women. The natural end to their life would be death on the battlefield. Frederick played music with the great composer Bach, he wrote poetry with the great philosopher Voltaire and he built magnificent palaces such as Sansoucci outside Berlin at Potsdam. He was simply a multitalented genius and Voltaire once remarked jealously that he could not imagine how it was humanly possible to write such brilliant poems as quickly as Frederick could do. Let´s remember that Voltaire was and still is regarded as a genius and yet he felt very inferior compared to Frederick. Voltaire later fell out with Frederick and slandered him greatly. Frederick was calm and didn´t resort to any counter attack. When in field with his army Frederick would always get up at 4 am and oftentimes start the day by playing flute. He would many times compose poems just before battles when his soldiers and generals were fearing for their lives. Frederick lived somehow beyond mortal life and death and had a very lofty mindset and extreme courage. 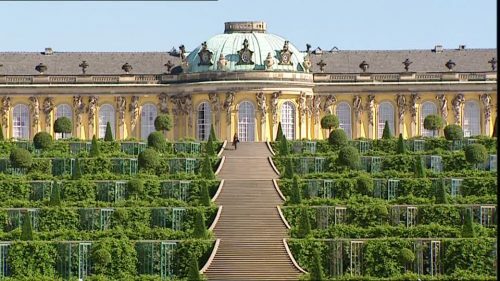 Frederick and his father emphasized the inborn differences between men and women and after Frederick ascended the throne he let his wife, Queen Elizabeth Christine, live in her own palaces to take care of the Royal Court life and receptions while he was busy building his empire and living with his mostly military court in other palaces, ie Sanssouci in Potsdam. In Prussia it was widely regarded that the King should keep a distance from his wife or else he would be controlled by her which could risk the kingdom. 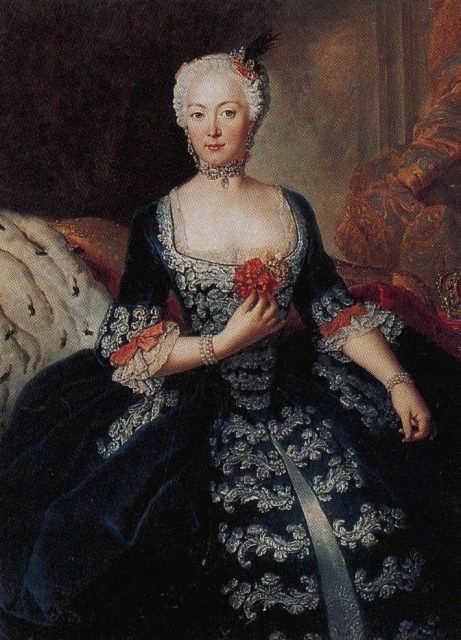 Frederick respected his wife highly and commended her for her great ability to take care of the court life in Berlin, which disinterested the militaristic Frederick. The Queen was a role model of piety and humility which greatly impressed Frederick´s father. The humble Queen in her old days said of herself: “God has graciously kept me, so that I need not reproach myself for any action by which any person has with my knowledge been hurt.” She had honest admiration and love for her husband Frederick throughout her whole life.